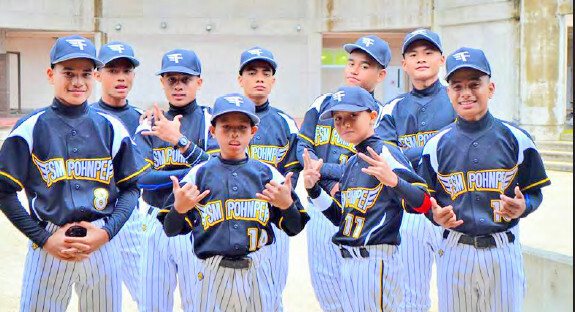 FSM—The FSM Little League team from Pohnpei once again performed admirably at the 2016 Asia Children’s Baseball Tournament in Onna Village and Uruma City, Okinawa, Japan. The tournament was hosted by Nippon Travel Agency, Uruma City, and the Okinawa Prefectural Government. Last year the team competed only in non-tournament friendship games but this year they took part as full participants competing against teams from Okinawa, Kyushu, and Pohnpei. They did not win either of their two full tournament games but the scores were quite tight. They lost 4 to nothing to the Shimajari, Okinawa team. They also lost 4 to 3 to the Okinawa Diamond team but later beat that same team 5 to 1 in a friendly game. The team was given a star’s welcome by the “Okinawa – Ponape Friendly Association”. Because of their participation this year, the team was invited to compete again in March of 2017. During that competition there will be teams from Singapore, Russia, Philippines, Malaysia, Indonesia, and Okinawa. The FSM Amateur Baseball Association which was formerly known as the FSM Junior Baseball Association has already begun to prepare for the 2017 trip to Okinawa and is accepting new applications for FSM players now. Keanu Dwayne Edgar, Trevor Cameron Gallen, Johnwen Loyola, Christopher Jadwick, Adalpret Jovany Semens, Eneriko Doneven Pablo, Lane Loyola, Julio John Villazon, and Leorenzo Ernest. The Coach was Kazuhiro Fujita. Numerous generous donors contributed substantially to help make the trip possible for the Pohnpei team including Micronesia Registration Advisors, FSM Line, Mr. Takahashi, Ocean Care Company, Black Sand Store, Kaselehlie Diner, Pohnpei Elemi Outlet, Genesis Pharmacy, Micronesia Insurance, Ray and Dors, Best Buy, Caroline Fisheries Corporation, and Taiyo –Pohnpei Corporation. Merria and Swyther Clark, a Pohnpeian family living in Okinawa welcomed the players during visit with open arms and helped them while they were there.